Not to be confused with Maryvale, Queensland (Livingstone). 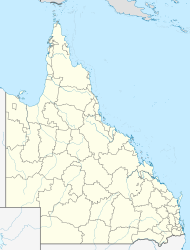 Maryvale is a town and a locality in the Southern Downs Region, Queensland, Australia. At the 2011 census, Maryvale and the surrounding area had a population of 350. Maryvale is on the Darling Downs on the Cunningham Highway, 127 kilometres (79 mi) south west of the state capital, Brisbane. Glengallan Creek which rises on the western slopes of the Main Range is a tributary of the Condamine River. It passes through the locality from east to west. The creek is a source of irrigated water for terraced crops in the area. At the southern and northern boundaries of Maryvale, elevations rise to greater than 900 m above sea level. The town's name is derived from a pastoral property name first used about 1847 probably by Patrick Leslie or James Hay. A pastoral station was selected in the area in about 1840 by John Cameron. However, Cameron found it difficult to transport the wool from their sheep down through Cunninghams Gap to be sold. Therefore, he relocated into the Fassifern Valley in 1842. The pastoral run at Maryvale was sold to Arnold Weinholt in 1848. Maryvale was the terminus for the Maryvale branch railway from Warwick. Maryvale Post Office opened by March 1914 (a receiving office had been open from 1913) and closed in 1981. Maryvale State School is a small school that caters for Prep to Year 6. The school opened its doors 21 April 1913. The Southern Downs Regional Council operates a mobile library service which visits Maryvale Park in Taylor Street. ^ a b Australian Bureau of Statistics (31 October 2012). "Maryvale (Southern Downs) (State Suburb)". 2011 Census QuickStats. Retrieved 2009-03-31. ^ a b "Maryvale - town in Southern Downs Region (entry 21178)". Queensland Place Names. Queensland Government. Retrieved 29 December 2017. ^ "Maryvale - locality in Southern Downs Region (entry 45950)". Queensland Place Names. Queensland Government. Retrieved 29 December 2017. ^ "Maryvale State School". Retrieved 1 February 2018. ^ "Library Details". Southern Downs Regional Council. Archived from the original on 31 January 2018. Retrieved 31 January 2018.